by Frederick Gonnerman. Rowman & Littlefield, 2003. Frederick Gonnerman, an Evangelical Lutheran Church in America pastor and former Director of Public Relations at Luther Seminary, says that communication “can be compared to a web that touches, connects, and even sensitizes all the elements of congregational ministry.” Gonnerman believes that congregations must produce more effective and professional publications if they want to enhance their ministries, increase the possibility of their message being heard, and positively impact those in and outside of the congregation. Then Gonnerman shows readers how to accomplish the task he promotes. 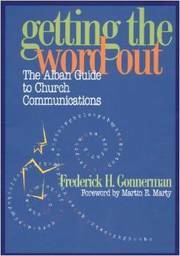 Gonnerman’s foundational text on church communication addresses topics such as defining your audience, improving readability, and making the layout of material appealing to readers. Gonnerman also discusses contentious communication issues, such as who has ultimate editorial responsibility and authority. Readers who have not begun using the Internet for ministry will appreciate the research, ideas, and tips that Gonnerman offers in the electronic ministry chapter. The four appendices help readers 1) evaluate their communications system, 2) review English grammar and punctuation, 3) determine readability, and 4) discern appropriate fonts. Written in a clear and direct style, Gonnerman’s work is for religious leaders and staff, lay-leaders, and anyone who wonders if their congregation is producing the best publications it can.